What happens when you take equal parts mini-golf and drinks, add a dash of fun and philanthropy, and let bake for a day in the sun? In a true recipe for success, we are proud to cook up an entertaining weekend for any fun-loving Jacksonville resident or visitors. Putt N’ Crawl has been bringing people together in Jacksonville Beach since 2004. With 15 years of putting & crawling, we never stop adding excitement. Regardless if you haven’t gone or have been with us every year, there are always new prizes to all who dare tackle the challenge of each home-built putting green. Sharp-eyed participants should also be on the lookout for special celebrity teams that always are circulating throughout the event. Note to all participants: dress to impress! If by yourself or using team chemistry, fun & crazy outfits are encouraged. So make sure to dress in your best golf attire because this is one event where style is rewarded. So pull on those argyle socks, plaid shorts, and top it off with your favorite sun visor! 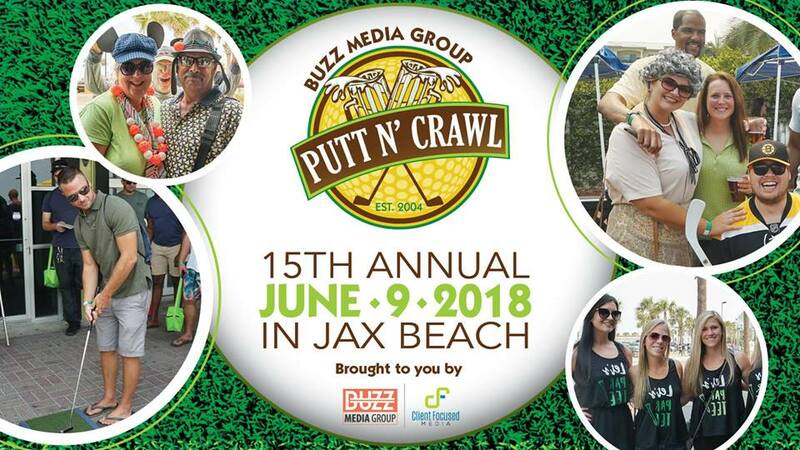 As with all of our Putt N’ Crawls, there will be drink specials available to all paying Putt N’ Crawlers with official wristbands.Official participants will have the opportunity to putt their way through advanced and challenging holes and have the chance at thousands of dollars in prizes. Tickets available now for $20 in advance or $25 the day of the event at selected participating vendors! Click HERE for tickets! Sign-in begins at 1pm at Lynch's Irish Pub, Ocean Grille or Zeta. iRocker SUP, a Jacksonville based paddle board company, is proud to sponsor the 15th annual Putt N' Crawl! Come out to Jax Beach on Saturday, June 9th from 1-7pm.